Home »News and Analysis»Toronto: Who Protects The Nazis? Toronto: Who Protects The Nazis? In Toronto at least, it’s abundantly clear that the police protect the nazis. This has been apparent at several heavily-policed events over the last two years there and is becoming so extreme that it’s hard to tell if the people harassing and assaulting antifa counter-protestors at rallies held by Islamophobes and bigots are the nazi rally participants or the kkkops in the Toronto Police Service. Such was the case at the April 28th Pegida Canada rally at Toronto’s city hall. The two dozen or so usual suspects on the Islamophobe side were not just protected by the cops, but were also enabled by them. For example, when one of the bigots attacked an anti-fascist, knocking him to the ground and kicking him in the head, the po-po were quick to separate the sides and take the attacker to the sidelines for a smoke and a chat, but not to arrest him. But when the nazi assholes decided to attempt to hold an impromptu and unpermitted march through the downtown streets and antifa peaceful stood in front of their route to prevent that, the police waded in with pepper spray and billy clubs, assaulting the antifa counter-protesters so an illegal nazi march could proceed. 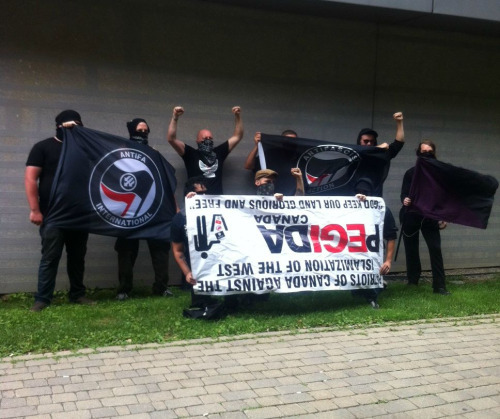 At least one anti-fascist, P., now faces absurd charges of assaulting a police officer and being “masked with intent.” P reached out to us to ask for some legal defence support and we decided without hesitation to offer our support to him. We wish him the best of luck beating these fabricated charges issued by the cops with the clear intention of deterring people from coming out to oppose Islamophobes and racists organizing to commit violence in their communities. Cops and the Klan go hand-in-hand. Thanks for sharing this and for supporting P, solidarity! Keep us posted about their case and about any upcoming fundraisers. Small critique though: I understand the frustration at seeing the police hypocritically side with the fash, but it doesn’t feel useful to me to insist on their march being “unpermitted”, “illegal”, etc. Do we actually want the police to decide what’s allowed in the streets? Of course not. Similarly, the language around “peacefully” blocking the far-right and their attempts to bring “violence” to our communities — this false dichotomy between violent and peaceful is mostly used against anarchists and anti-fascists and I don’t think we should be using it in the rare moments when it might suit us. Anti-fascism is seldom peaceful, all our mobilizing is technically illegal, and I reject the police as arbiter over acceptable politics or conduct. This might sound like nitpicking, but I think the way we talk about our struggles matters and is a big part of laying a principled groundwork for solidarity.